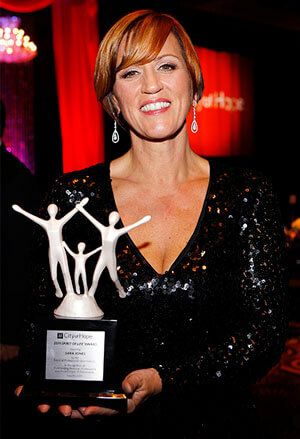 City of Hope’s National Professional Salon Industry named Sara Jones, Senior Vice President and General Manager of Joico, as the recipient of the 2011 Spirit of Life Award. On July 30, 2011, Jones was honored for her outstanding philanthropic and business contributions at the annual Spirit of Life Award Dinner, held during the Professional Beauty Association’s Beauty Week in Las Vegas, Nevada. All proceeds were earmarked for women’s cancer research and care. City of Hope is a leading research and treatment center for cancer, diabetes and other life-threatening diseases. 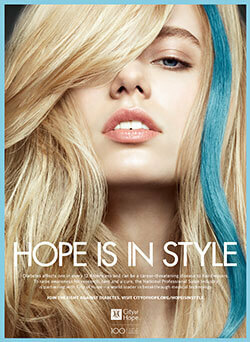 The organization’s Professional Salon Industry Division was established in 1981 with the purpose of establishing a continuous flow of industry support for the City of Hope. It is an annual tradition to honor outstanding leaders in the industry for their contributions both in business and through philanthropy in the community, with the Spirit of Life Award. Since its inception, this division has raised millions of dollars for City of Hope’s research and treatment programs. Visit the City of Hope website. Read More About The Spirit Of Life Gala. Jones’ acceptance speech came at the end of an action-packed Spirit of Life weekend in Las Vegas. The entire Joico corporate and field team arrived for the event, and the day of the gala was spent beautifying guests in the Joico Glam Suite at the Mandalay Bay Hotel Convention Center. The gala kicked off with glamorous “red carpet” arrivals, complete with paparazzi, and the evening featured the hilarious actress and comedienne Aisha Tyler as emcee. City of Hope’s Rahul Jandial, M.D., Ph.D. offered encouraging news of new medical developments that are pointing to substantial improvements in breast cancer treatments and cures. Zotos President and CEO, Ron Krassin and Corporate Executive Officer and Director, Shiseido’s Carsten Fischer, were present to honor Jones, along with stylist heavy-weights Damien Carney, Sue Pemberton, Beth Minardi, George Papanikolas, Anthony Morrison and Dean Banowetz. City of Hope is a world leader in the fight against cancer, diabetes, HIV/AIDS and other life-threatening illnesses. This year, City of Hope has named Wella North America CEO Reuben Carranze its Spirit of Life Award recipient. Reuben has earmarked funds from his campaign to support research and treatment for diabetes. Having seen the impact of the disease on the lives and livelihood of his hairdresser-family. Reuben is asking for your support to raise awareness and funds to fight this often-unseen threat to the salon industry. Hairdressers Helping Hairdressers raised much-needed awareness and funds for stylists and salon owners affected by Hurricane Sandy. All proceeds funded directly to the Professional Beauty Association’s (PBA) Disaster Relief Fund. The PBA Disaster Relief Fund awards 100% of funds raised to help industry professionals impacted by natural disasters as they begin rebuilding. Visit the PBA’s Disaster Relief Fund website. The Beauty Bus Foundation was founded in loving memory of Melissa Marantz Nealy who passed away the age of 28 from a degenerative neuromuscular disease. Melissa loved a good day at the spa. When her ability to leave the home became compromised, Co-Founder Alicia Marantz Liotta, Melissa’s cousin, was able to schedule in-home beauty services through her connections within the beauty industry. Witnessing the hope, happiness and respite these services brought to Melissa, Alicia and Co-Founder Wendy Marantz Levine, Melissa’s sister, were inspired to launch Beauty Bus Foundation. Visit the Beauty Bus website.